The Mission of the Ann Arbor Hands-On Museum is to create moments of discovery that inspire curiosity, exploration and respect for STEM and the natural world. Our Vision is a world where curiosity today leads to more purposeful lives tomorrow. We strive to inspire people to discover the wonder of science, technology, math, art, and engineering. Our Vision is to be the leader in imaginative and interactive learning experiences. Our annual report highlights some of the many ways we achieve these goals. Anne Marsan, Secretary Senior Software Architect, CareEvolution Inc.
David Esau Immediate Past Chair Architect, Cornerstone Design, Inc. The mission of the Ann Arbor Hands-On Museum (AAHOM) is to inspire people to discover the wonder of science, technology, engineering, art, and math (STEAM). Our vision is to be the leader in imaginative and interactive learning experiences. Thanks to a steadfast belief in the power of STEaM when placed in the hands of pre-K through 8th graders, we enjoy one of the highest annual attendance rates at a science center in the State of Michigan: over 290,000 visitors in the last year. We have over 7,750 family members, demonstrating the value they find in our exhibits and programs. AAHOM opened 34 years ago in an historic firehouse in downtown Ann Arbor and quickly became the cornerstone of informal science education in the community. This was achieved by working with scientists, artists, designers, engineers, and innovators who transferred their extraordinary talents and knowledge into the creation of simple, effective science exhibits that can be understood by children, their families, and audiences of all ages. Following several expansions, AAHOM now occupies 40,000 square feet, with 20,000 devoted to exhibit space for 250+ interactive exhibits designed to promote science discovery and literacy. Over 5.4 million visitors have visited AAHOM since it opened its doors in 1982, making it one of the most popular science centers in the State of Michigan. In the last fiscal year (October 1, 2014-September 30, 2015), 73% of AAHOM visitors came from five counties in Southeast Michigan as follows: Washtenaw (32.8%), Wayne (22.7.%), Oakland (13.6%), Livingston (3.4%), and Macomb (3.4%). Our education programs align with State of Michigan Grade Level Content Expectations and Next Generation Science Standards. Outreach and Distance Learning programs served 44,823 people off site in FY15. Our temporary, traveling exhibits have been displayed in libraries, community centers, and shopping malls throughout the state. AAHOM is dedicated to ensuring that our doors are open to all children, regardless of ability to pay admission charges, we offer discounted or free admission to Title One schools, families with patients at C.S. Mott Children's Hospital, Ronald McDonald House guests, subsidized housing residents, special needs children and adults, and ESL families. The Discover Science Assistance Fund was established six years ago in response to schools seeking financial assistance for field trips. Schools where 50% or more of the students receive free or reduced lunch are eligible for this funding. We are proud that in FY15 we subsidized visits from 200 schools, serving 13,219 students, thanks to grants and donations to this fund. We accomplish our mission with 20 full-time and up to 40 part-time staff members, as well as interns, work-study students and volunteers. Volunteers include over 400 community members, professors, high school and college students, and local business people who donate over 5,000 hours of their time annually towards helping AAHOM deliver exceptional programs, events, and exhibits. Click here to view our profile on GuideStar. The Ann Arbor Hands-On Museum respects the privacy interests of our website users. This Privacy Statement describes the types of personal information that we collect, the uses we make of that information and how you can access, correct and request deletion of any personal identifying information that you choose to give us. The Ann Arbor Hands-On Museum does not collect any personally identifying information about visitors to this website, such as your name, address or email address, unless such information is provided by the individual. However, certain non-personal information is recorded by the standard operation of the Ann Arbor Hands-On Museum Internet servers. We may ask you for personally identifying information if you contact us through our website or purchase a membership or to make purchases from our online store. This information may include your first and last name, mailing address, email address, telephone number and payment information (credit card number and expiration date). Your personally identifying information is used solely for billing purposes and to provide membership services (including providing the Ann Arbor Hands-On Museum News and special event notification). You may opt out of receiving special notifications at the time of purchasing your membership or store merchandise, or upon receipt of any such special notifications. The Ann Arbor Hands-On Museum does not share personally identifying information or individual purchase information with any other businesses or individuals. We may use your personally identifying information, such as your email address, to contact you if we have trouble processing an order, to confirm receipt of your membership or for other similar purposes. We may use aggregated information, which does not identify you personally, for advertising, marketing, promotional and other business purposes. Click here for Photo Release for Facebook Photo Contest. If you want to see the personal information we have collected about you from this site or if you believe any information we have is incorrect and you wish to correct it, please write to us at the address given at the end of this Privacy Statement. If we change or delete information in response to your request, we will not then continue to use it; however, some residual information may remain in backup records or records of deletions. We use efforts consistent with sound industry practice, to safeguard the confidentiality of your personally identifying information. This website takes every precaution to protect our users' information. When users submit sensitive information via the website, your information is protected both online and off-line. When our registration/order form asks users to enter sensitive information (such as credit card number), that information is encrypted and protected. While on a secure page, such as our order form, the lock icon on the bottom of Web browsers such as Firefox and Microsoft Internet Explorer becomes locked, as opposed to un-locked, or open, when you are just "surfing." Given the nature of the Internet, however, we cannot ensure complete security and we are not responsible for any breach of security or for the actions of any person or entity other than the Ann Arbor Hands-On Museum. Your personally identifying information may be disclosed if we are compelled by law or legal process to disclose it. We will make commercially reasonable efforts to see that your information is treated in compliance with this Privacy Statement. Children under 13 should not send any information about themselves to us, including information like your name, address or email address until a parent or guardian has first given permission. The Ann Arbor Hands-On Museum takes this principle seriously and will not accept orders or purchases from persons who have not verified their age. Memberships are non-transferable and non-refundable. Tickets to events are non-refundable. At the Hands-On Store, we stand behind our products, and we genuinely hope you enjoy your purchase. If for any reason you are not satisfied with a product you may return the product to us within 30 days. Returned merchandise must be unused and returned in original packaging. Please include a copy of your sales receipt with your shipment, and indicate whether you would prefer a refund or an exchange of the item. Return shipping costs will be paid by the Ann Arbor Hands-On Museum in the event of damaged or defective merchandise only. Returns should be made to the address at the end of this Privacy Statement. The Ann Arbor Hands-On Museum may, from time to time, determine that changes in its policies, including this Privacy Statement, are prudent. If any such changes are made, they will be posted on this website. You should review the Ann Arbor Hands-On Museum Privacy Statement and other policies posted on this site for potential changes when you return to the site for future visits. If you experience problems with the Museum’s website, your membership or the Museum’s services, or if you have any questions or comments, please contact us at: 734.995.5439 or 220 East Ann Street, Ann Arbor, MI 48104, or use our Contact Us Form. Welcome to our Press Room. Find out more about the Museum and what's going on here by clicking one of the links below. Read and print out Museum's press releases. View Media Alerts about our upcoming events. 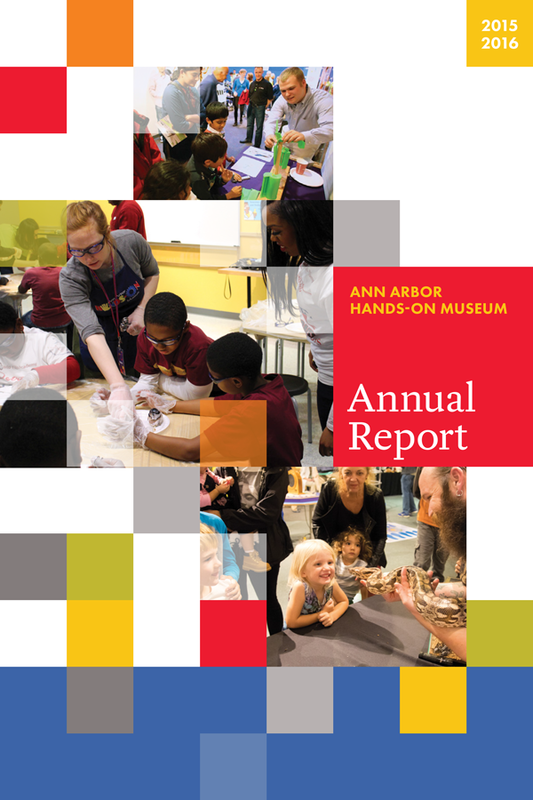 Over 5.7 million people have visited the Ann Arbor Hands-On Museum since 1982. The Museum is a regional destination, drawing 55% of its visitors from outside Washtenaw County. Annual attendance (onsite and offsite) has grown in the last ten years from 200,000 to 324,505 in FY2017. Family membership continues to grow, with 8720 members in FY2017. Over the years, the Museum has received national recognition from the National Science Foundation, the Institute of Museum and Library Services, the Association of Science & Technology Centers, and the Center for Interactive Learning and Collaboration. TechTwilight, our signature event continues to be incredibly successful with more than 400 people attending the event in 2017. 736 groups visited the Museum on Field Trips in 2017 and we provided subsidies, thanks to the Discover Science Assistance Fund, to 310 schools. Our Outreach programs served over 40,000 people in 2017 and were delivered to schools, libraries, community centers, camps, and festivals, throughout Michigan (including the annual tour of the Upper Peninsula) and in Ohio and Pennsylvania. Our Distance Learning programs reached more than 8,000 people in 2017 throughout the U.S., Canada, and Australia. Our Birthday Parties had more than 6,000 guests.